Geneva > UN Committee against Torture (CAT) questions Austria over Intersex Genital Mutilations – Flat-Out Denial by Gov! Austria was the first of no less than 3 countries reviewed for IGM practices during the 56th session of the UN Committee against Torture (CAT) caught lying through their teeth (to be succeeded by Denmark and Hong Kong + China). The Committee had already recognised non-consensual intersex surgery and other treatments as violations of the Convention when examining Germany in 2011 and Switzerland earlier this year. The >>> Thematic Intersex NGO Report by VIMÖ Association of Intersex People Austria in collaboration with Zwischengeschlecht.org / StopIGM.org had laid the groundwork, referencing practical examples of the most frequent forms of IGM practices still being perpetrated in many University Clinics, as well as the impunity of the perpetrators and the complicity of the state. During the extended Intersex NGO Briefing, Alex Jürgen’s moving testimony to the lifelong consequences of IGM proved most effctive to make the Committee members really understand the implications IGM practices. Markus Bauer offered a global perspective of the practice as well as current local examples, and Daniela Truffer substantiated the lack access to redress for victims, the factual impunity of the perpetrators (including the very ones responsible for what they did to Alex), and how the State refuses to fulfill its obligation to protect intersex children, but instead protects the perpetrators. So we were very pleased when during the following two-day session Chairperson Claudio Grossman, one of the Committee’s two country rapporteurs for Austria, on Thursday 12 November asked the Sate Delegation about IGM practices, if the state was aware of this violation? Are there any legislative measures in place? What could be done to prevent it? And when the next day Austria replied only dismissively, Grossman digged deeper in a second round of questions. In contrast, Austria’s answers delivered by Hon. Prof. Dr. Gerhard Aigner (Federal Ministry of Health) on Friday 13 November were not only a disgrace, but once again underlined how IGM practices are still only an “emerging” human rights issue, of which Governments still seem to think, if they ignore it long enough, it will disappear just as well. Not only did Aigner flatly dismiss Austria’s responsibilty for the ongoing practice, but he flat-out denied non-consensual intersex treatments still being perpetrated in Austria, instead claiming after a “transgender-intersex paradigm shift” doctors would have renounced the practice in 2013 according to a “new guideline”. *) Finally, according to Aigner in his second (non-)answer, with the influence of “Dr. Google” over today’s patients, surely doctors couldn’t pressure them to unwanted treatments anyways. *) An obvious reference to the current Austrian “Gender Dysphoria Guideline”. Which of course has has ZERO to do with intersex and IGM practices, except that government representatives (see also Denmark and China) trying to deflect from complicity in IGM practices inevitably tend to resort to the good old “LGBTI excuse” or “pinkwashing” of IGM, since most people have no clue about IGM, so usually nobody won’t notice. 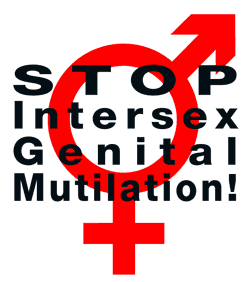 Geneva > UN Committee against Torture questions Denmark over Intersex Genital Mutilations – Flat-Out Gov Denial, Again!